Russian Sour Cream Coffee Cake. Yesterday it was my turn to bring breakfast for our weekly work Breakfast Club. Taking a more traditional approach than I did last time, when I brought in my quesadilla maker (Olé), I volunteered to bring in two coffee cakes. One had to be Sicilian Orange Cake, because it just might be the king of all coffee cakes. But I wanted to try something new for my second offering, so I made this Russian recipe. Its sour cream base makes it creamy and moist, and the nut topping gives a little bit of texture and spice. And if the “king” title is already taken, this one can be the coffee cake Tsar. *Wondering where the photo of the finished product is? Well, in the chaos of my cake-laden commute that morning, I forgot to give it its proper photo shoot. I guess that means I’ll just have to make it again! Cream together butter, sour cream, 1 cup of the sugar, eggs, and vanilla. In a separate bowl, combine flour, baking soda, baking powder, and salt. Add the dry ingredients to the wet in three batches, stirring well after each addition. 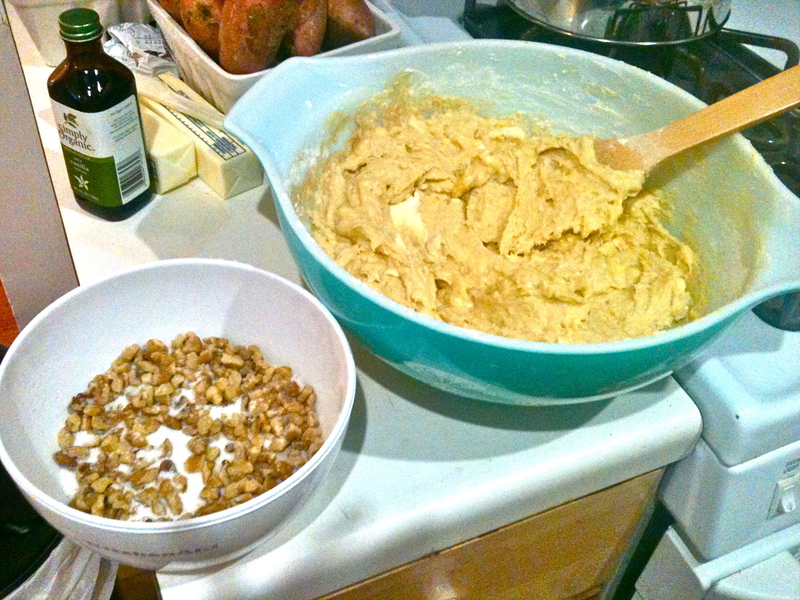 In a separate bowl, combine the walnuts, ginger, nutmeg, and the 1/2 cup of sugar. Grease a baking pan. 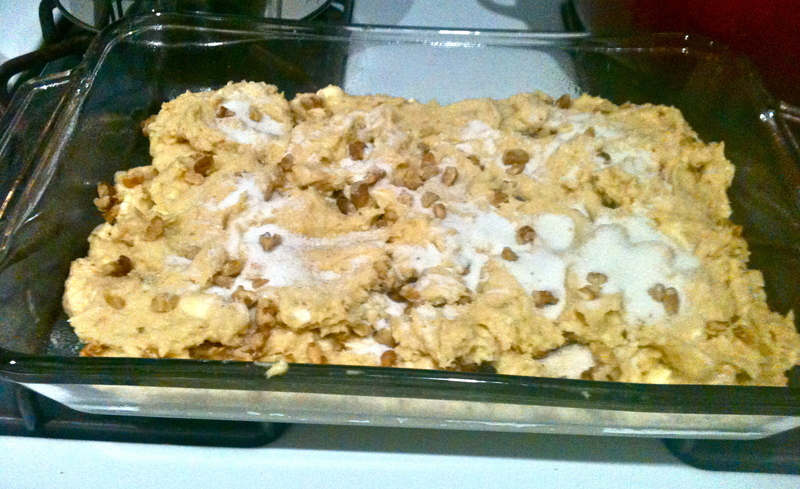 Spread half the batter into the pan and top with half the nut mixture. 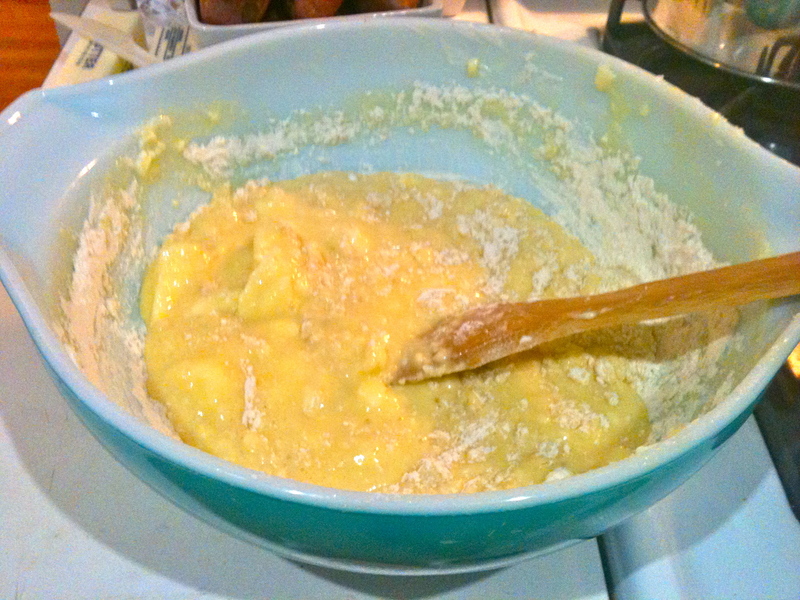 Then spread the rest of the batter over the top and add the rest of the nut mixture. Using a knife, make several slashes through the batter; this draws some of the nut mixture deeper into the cake. Bake on middle rack for about 50 minutes, or until a toothpick inserted into the middle comes out clean. Priyatnogo appetita! Next Windowsill Herb Garden and Garlic Thyme Olive Oil.